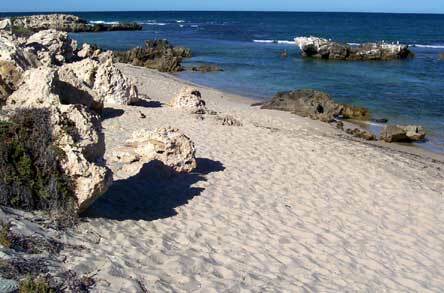 Scarborough beach is one of the great white sandy beaches of Perth for Perth Beach fishing. 100 metres offshore are the sea grass beds marine environment which provides food and shelter for different varieties of fish and sea mammals at different seasons. Recreational fishing is a popular pastime in Perth Western Australia. 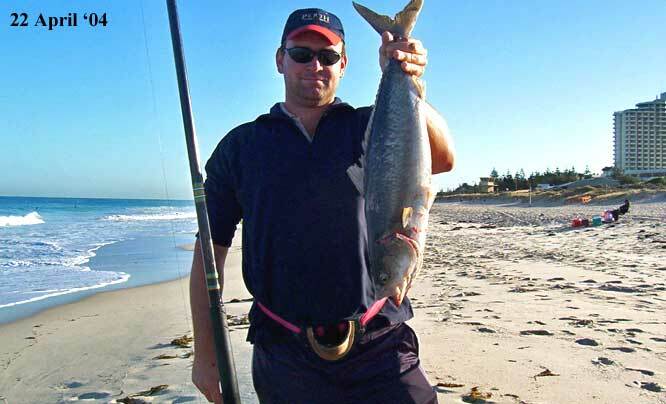 Hopefully the record on this Perth beach fishing page will help you to decide what fish to go for, in what fishing season. You're invited to post messages about fishing on Perth Beaches including fishing at Scarborough Beach on the Perth Fishing Forum. Scarborough Beach Perth Fishing photo of 2016 wins a prize donated by www.fishingperth.fishing. To win the Perth's Fishing Photo contest, post your prized fish photo to the Boating and Fishing section of Google+ Perth. 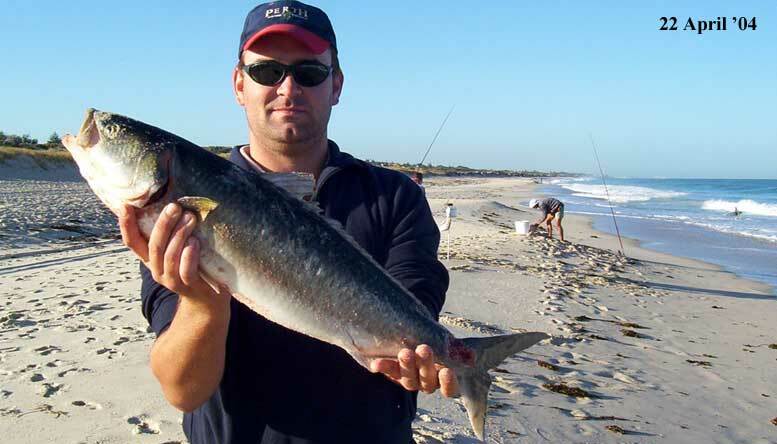 Anglers can post up-to once per month, your Perth fishing photos in the Google+ Perth Boating & Fishing photo gallery. Herring best mornings, Mid summer to April. Whiting all year. Mostly small close to shore. Taylor are usually fished for from sunset. Drift bottom fishing from a kayak in winter for squid. Many deep sea fishing charter boats depart from Hillarys Harbour just 8km north of Scarborough. 25 min bicycle ride to Hillarys habour is recommended. Warm water fish such as flying-fish have been seen late summer. They remind me of night fishing - scooping with oversized butterfly nets from an outrigger canoe outside the reef with the Chief of Aitutaki where I got an IGFA world record for a Humped Headed Maori Wrasse. Rod benders include harmless sand sharks and stingrays. All mammals are protected. Common are dolphins, seals and whales in months October to December. Bag and fish size limits apply. 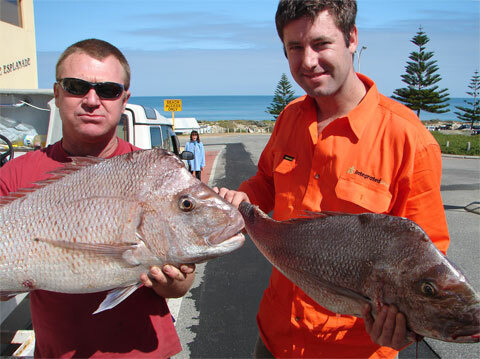 Get your Perth Recreational Fishing Licence here. Above my Aitutaki game fishing boat captain Ian with snapper fish caught dawn 24 October, less than 1 kilometre from a Perth Beach boat ramp.Western Australian Salmon were running by Scarborough Beach in April. At sunset you can see Western Australian Salmon swarming near the surface off Perth Beaches. I used to catch salmon with my Dad at the North Mole, Fremantle, Western Australia. Most of his fishing was where now the Marmion Marine Conservation Park is, located 5 km north of Scarborough and Trigg Island. is now where, the community used to light HUGE bonfires on Guy Fawkes' Night. Protected inside the Marmion Conservation Marine Park which is great for snorkelling, a good way to see which inshore costal water fish are in season off Perth beaches and reefs. Having lived on a small South Pacific Island for 10 years, non-Polynesian names escape me? Caught November 150 metres off Brighton Beach. Not sure what these fish are but they tasted great and were double header catches by the count of 3 every time. Had to paddle my sea kayak in before it sank with the load of fish. Squid and jigging for swarms of ..
Sell bait & fishing tackle in Perth? for < $1 per day. May sea kayak fishing Perth, 1km off Brighton Beach. I pulled up my live bait when a small 2m shark swam by. Offshore breeze, and sunny. Advertise your Perth fishing tackle shop here. Your Perth fishing charters advertisement here. would you like to sponsor a fishing page? 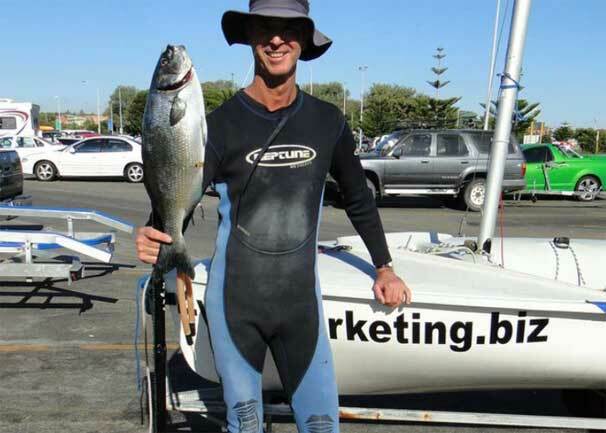 Scarborough website, sails to Perth's Three Mile Reef near Scarborough for spearfishing. Fishing Aitutaki Cook Islands See my game fishing boat captain who now fishes in Perth, in Perth fishing videos above.